I've looked through all the threads and I couldn't find anything similar to this topic (except for maybe the dress polls). I thought that this might be a fun thread where we can discuss Hayley's dresses and outfits. 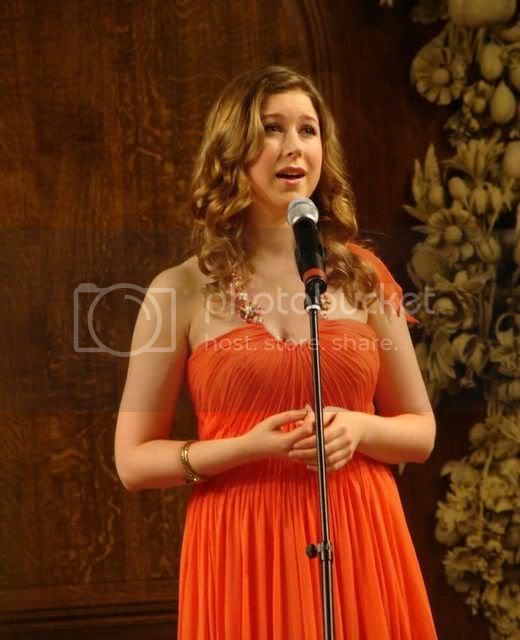 Hayley Westenra, another New Zealander and world famous young singer has also joined my list of celebrity clients. She has bought a beautiful and edgy red evening dress for her Valentine's Tour of concerts and her forthcoming tour of Japan. I don't suppose she means this dress? Hayley's Classical Brits 2008 outfit was made by designer Xterity. I also think that if you go to "Press" and click on "Grazia" you can see a model wearing Hayley's gold dress. Wow, Hayley must have gone on a decent shopping spree at their store at the beginning of 2008! Maybe they gave her a discount in exchange for wearing their dresses to all of the Classical Brit promotion? It seems like a pretty swanky place -- to have a look at the outfits you need to book a time for their private showroom! But looking at the prices, I guess they don't want the great unwashed pawing through them). Wow, I'm having so much fun doing this! What a superb piece of detective work! 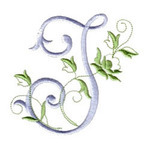 i21.photobucket.com/albums/b294/hdjoespics/EEjdKsU.gif and a great new thread. Hayley used to be amused by 'us blokes' being interested in her dresses, but I guess she's used to us now! Interesting that most of the dresses depicted only appeared at special functions and only the black 'Iron Man' dress and the short red one (which Rachel actually says Hayley bought and which Hayley recently said in an interview is her current favourite) are worn regularly by Hayley. I don't know how these things work but wonder if it's a case of "buy one - borrow one"
Edit: I've just had a quick scan of the web site and there is mention of 'dressing' Dami Kiri for the recent Classic FM cover, so it looks as though that may be one answer. As a male I find this very interesting Jillian. This is certainly the sort of establishment Hayley should be utilising. It says everything that simply being Hayley says about Hayley--sheer class. Thanks for sharing your find which I suspect may be more interesting to the girls here than us men but class is class and even we males know when we are seeing it! Thanks for sharing this, jillian. The website didn't show Hayley's green dress, though. What's her orange dress from? In one article I read, Hayley said she got a gown from a shop in San Antonio, Texas, where Beyonce had gotten some of her dresses, and that it was "stunning". I'm wondering if it's the orange one. Or maybe the old green one she used to wear, since Paula Abdul found the design, too? The intro on the Xterity website showed a fashion show, and they all looked like they were modeling witch costumes. I noticed that they didn't show the green dress -- I wonder if that's because it might not be from their 'ready to wear' collection? It's possible that Xterity may have made that up especially for her. I had a look at their bridal collection and they had many of the same 'influences' as Hayley's Classical Brits dress. Ha, ha -- you're right about the witch costumes. One of the reasons I love knowing designers etc is to see how clothes translate from that heigtened, dramatic and artificial environment of a fashion show/shoot to a real person wearing them. 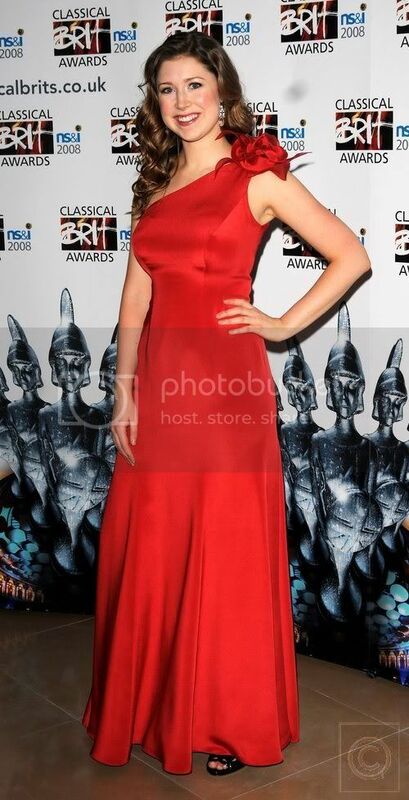 I desperately want Hayley to be going to the Classical Brits this year just so I can see what she'll be wearing! 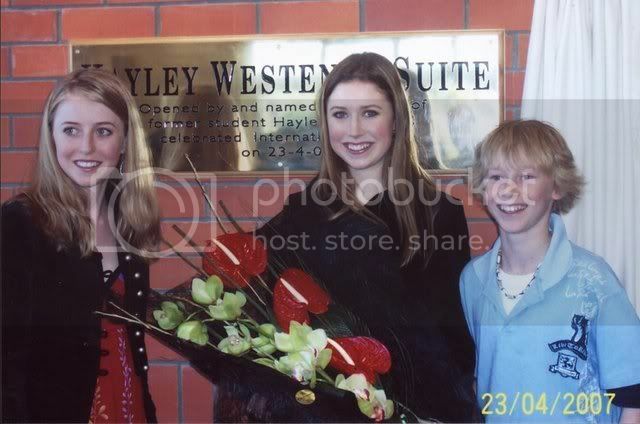 I just found this link to photos of a very young Hayley having a dress adjusted by NZ designer Sonya Harding. (I'd post the photos here, but the webmaster wants us to request his permission before we repost anything). That's the direct link to an AMAZING Japanese fan site: homepage2.nifty.com/~oha/profile/hayley/ The photo galleries on that site are spectacular. If you scroll down, the silver and black midriff top and skirt combo really is fantastic -- even if it is a bit of a relic from fashions past! If my memory serves me correctly, Hayley's green dress (the one Paula Abdul wore the shortened version of) was from a store in San Antonio Texas. Which orange dress are you referring to? The one that looks like a halter? That is from London, but which designer I'm not sure. Great idea for a thread though Jillian! I've enjoyed reading this. On the Sonya page I love the picture lower down with Jill and her two siblings. Ha, ha -- I love the photos where Hayley pretends to be a rock chick! Is this the orange dress you were referring to, Libby? Have a look at any of the concerts with Dave Dobbyn. I haven't seen that for a while - great to catch up with it again. Isn't that the top that Jillian likes and commented about recently? Yes, Jillian, that's the orange one I was referring to. So, do you know who made it? How were you able to find out where those dresses came from? 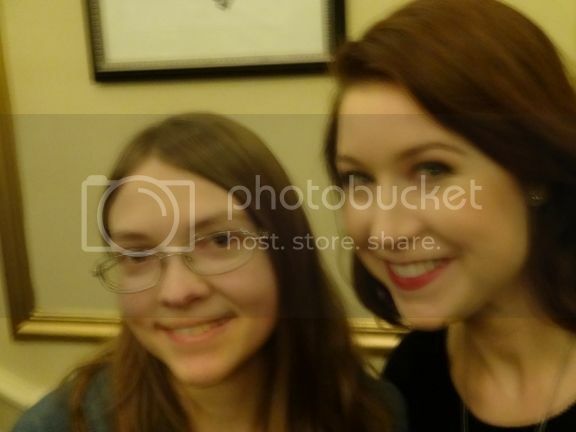 Did you just put "Hayley Westenra designers" in the search engine or something? I'm not sure that I'd call the red poppy dress "edgy". It's nice, though. That is a pretty cool video! That isn't the same top that I was referring to, Grant (though it is really cool). 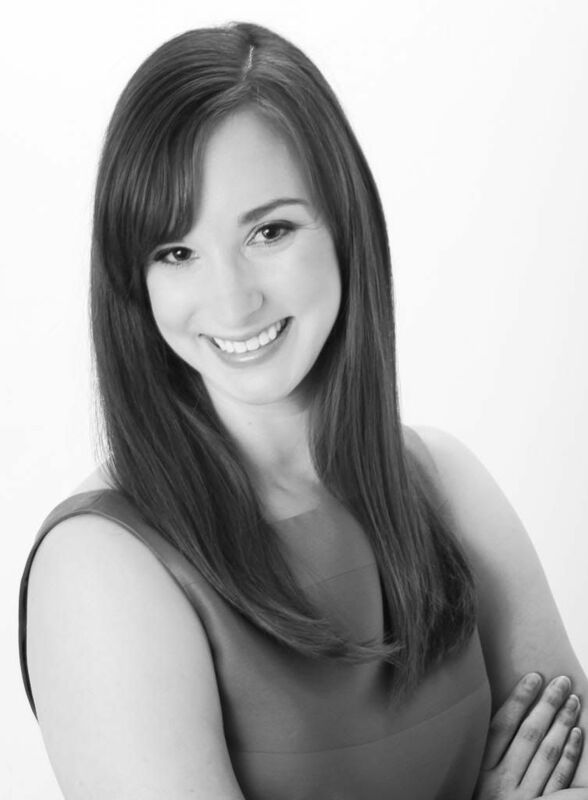 Libby, I found that info on the designers by just putting search terms like "Hayley Westerna designer" into google and just trawling through it all and adding a pinch of good luck! I actually do agree with the poppy dress being described as "Edgy". It's not your usual soft, cocktail dress. The poppies on the hem are actually pretty bold. The impact of more 'out there' clothing is always lessened by the stage or TV -- maybe because it's a performance etc, but I'm sure if you had a cocktail party at your house and one of your friends wore that dress it would make quite an impact! I have no idea who designed the orange dress, I'm afraid. I'll put that on my 'to do' list. Of all the dresses Hayley has ever worn, my favourite is the black dress she wore while performing 'Wuthering Heights' on her DVD. I think that it is spectacular and the lace hem (which has the effect of making the dress quite short) was really quite flash. Does anyone have any photos of the dress? I've looked everywhere and I can't find any. I agree heartily with you re that gorgeous black dress. Live from NZ DVD by me about Sept. 2006 interesting. To me its always been 100% Hayley !!! Here's another one from "Live from NZ". I tend to call it her Benedictus Dress. A most beautiful blue I have to say. PS would somebody please explain to me what "edgy" means? The cutting edge of fashion maybe?